Tristan l'Hermite (died c. 1478) was a French political and military figure of the late Middle Ages. He was born in Flanders near the beginning of the century. He was provost of the marshals of the King's household under Louis XI of France, which gave him enormous power in the Intrigues and plots that characterized that king's 22-year reign. The mystique surrounding his name caused the 17th-century French poet and playwright François l'Hermite to take his name as a pseudonym. He appears as a figure in Victor Hugo's Notre-Dame de Paris, in Walter Scott's Quentin Durward, in the Justin Huntly McCarthy play If I Were King, and in the operetta made from the play, Rudolf Friml's The Vagabond King. He is also a character, as a young man still in the service of Arthur III of Brittany, in Juliette Benzoni's "Catherine" novel, Les Routes incertaines. Tristan, also known as Tristram or Tristain, is a knight of the Round Table in Arthurian legend and the hero of the Tristan and Iseult story. François l'Hermite was a French dramatist who wrote under the name Tristan l'Hermite. He was born at the Château de Soliers in the Haute Marche. Mark of Cornwall was a king of Kernow (Cornwall) in the early 6th century. He is most famous for his appearance in Arthurian legend as the uncle of Tristan and husband of Iseult, who engage in a secret affair. Palamedes is a Knight of the Round Table in the Arthurian legend. He is a Saracen pagan who converts to Christianity later in his life, and his unrequited love for Iseult brings him into frequent conflict with Tristan. Palamedes' father is King Esclabor. His brothers, Safir and Segwarides, also join the Round Table. 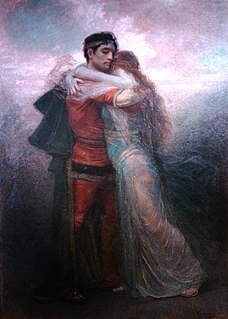 Tristan and Iseult is an influential romance story, retold in numerous sources with as many variations since the 12th century. 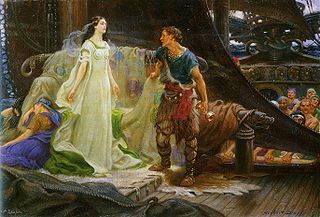 The story is a tragedy about the adulterous love between the Cornish knight Tristan and the Irish princess Iseult. The narrative predates and most likely influenced the Arthurian romance of Lancelot and Guinevere, and has had a substantial impact on Western art and literature. While the details of the story differ from one author to another, the overall plot structure remains much the same. Jean-Marthe-Adrien L'Hermite was a French sea captain and rear admiral, notable for his involvement in the Glorious First of June and his expedition into the Atlantic in 1805. The Vagabond King is a 1956 Paramount Pictures musical film directed by Michael Curtiz and Kathryn Grayson, Oreste Kirkop, Rita Moreno, Sir Cedric Hardwicke, Walter Hampden, and Leslie Nielsen. It is an adaptation of the 1925 operetta The Vagabond King by Rudolf Friml. Hampden plays King Louis XI. Mary Grant designed the film's costumes. 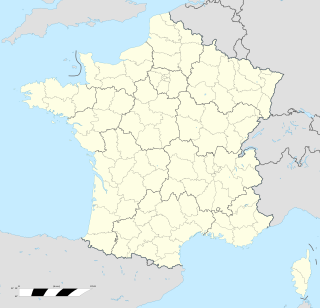 Janaillat is a commune in the Creuse department in the Nouvelle-Aquitaine region in central France. The Beloved Rogue is a 1927 American silent film, loosely based on the life of the 15th century French poet, François Villon. The film was directed by Alan Crosland for United Artists.